The 12-year-old girl who died Tuesday of suicide at her boarding school in Washington, D.C. had been bullied, her devastated mother says. Her name was Stormiyah Denson-Jackson, her mother, Pat Denson, told News4. The seventh-grader won awards in modeling competitions and was looking forward to going to college. But Denson-Jackson's classmates bullied her, her mother said. "She did tell me that a lot of kids would be bullying her, picking on her. And when she tried to tell the staff, they wouldn't do nothing about it," Denson said. "But when she reacted, they put her as the bully." 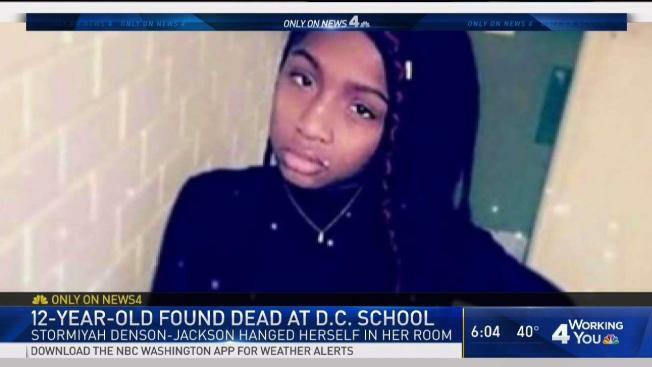 Denson-Jackson's body was found at The SEED Public Charter School of Washington (SEED DC), police said. A medical examiner confirmed Thursday she she killed herself. D.C. police responded to the school on the 4300 block of C Street SE, near East Capitol Street, for a report of an unconscious person. Denson-Jackson was found dead in her dorm room. Denson wept as she spoke about her daughter. "I sent my baby there to learn, not to die," she said. "I just can't understand it." The child's mother questioned the school's actions. "They supposed to look in the room and look on the bed to make sure that that child is in her space, every hour on the hour. That's what's supposed to be done. But it wasn't done. My child would be still here," Denson said. "I trusted them people with my child." A school spokeswoman said the security and safety of students are the school's top priorities. She declined to speak about individual students. Three women who have family members at the school told News4 bullying is a problem there. Kimberly Brent said her grandson was bullied and beaten up there last month. "He had a knot in his forehead, a knot in the back of his head. He had a concussion," she said. "Three young men in his eighth-grade dorm jumped him." Another woman, who asked News4 to withhold her name, said her daughter was victimized. "She has been bullied on more than one occasion," she said. "When told about the situation, nobody did nothing about it." The girl known to loved ones as Storm was full of life, they said. "She loved life abundantly," her mother said. "She had goals." A video shows her leading a group of friends in praying and then dancing joyously. "She was full of energy. She was always outspoken. She pretty much carried herself as a leader," Gary Hill, a pastor at the family's church, said. After Denson-Jackson's body was found on Tuesday, the parents of her classmates were called and told to pick up their children. "It's really sad that at 12 years old you feel like the only solution is to take your life. It's heartbreaking," said Keana Bedney-Wallace, the parent of another student at the school. "I'm a mom of five, and I couldn't imagine. I pray for the family, that they get through this." Earlier Tuesday, the school issued a brief statement. "We are deeply saddened to report that a SEED DC student unexpectedly passed away this morning. This is of course a terrible tragedy for the family first and foremost, as well as for the entire SEED Community," the statement said. "We ask that you respect the privacy of the family and of our community of scholars and teachers in their mourning." Opened in 1998, SEED DC is a public, college-preparatory boarding school that serves 370 students in grades six through 12. Ninety-one percent of its graduates have enrolled in college, and 80 percent are first-generation college students, the school's website says. On Wednesday, a stuffed animal and a bouquet of yellow roses were placed at the school's gate. If you are in crisis, call the National Suicide Prevention Lifeline at 800-273-8255 or reach out to the Crisis Text Line by texting 'Home' to 741741. For a long list of mental health resources, see News4's ongoing Changing Minds coverage.